We bought our first house in an old city neighborhood near downtown Pittsburgh. If we were part of any gentrification, you would not know it then or now. Most of the folks who lived within four blocks of us had been born there as had been their parents. Neighbors welcomed us kindly, but found us a little unusual. The main street that defined the edge of one side of the area was lined with Italian and Polish restaurants. For a brief moment when we lived there, the place also provided home to a few artists. An artisan iron works defined one corner. Tom Savini lived on our street. Art supplies stores and a a second-run cinema appeared. All (except perhaps Savini) are long gone now. Around the time we took on the task of renovating our new home, a cafe opened on that main drag right at the end of our street. The house was small and the cafe proved a good destination when we needed out. 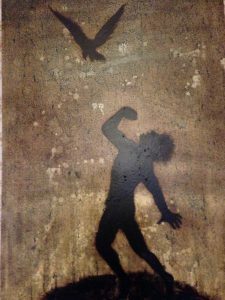 One afternoon, my wife returned home excited about the art that she had seen on the walls while drinking coffee. I had seen the sort of thing that they hung (you probably have too) and some of it was okay, but not something that our limited budget inclined me toward buying. Suzanne liked this portrait of William Faulkner. 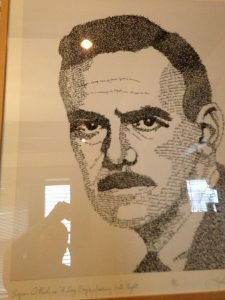 I do not remember how much I liked that one, but then I saw one of Eugene O’Neill. I think the cafe manager gave us John Sokol’s phone number. Off and on for a couple years, we had a sense of how much work John produced. We also saw what the life of a working artist meant, especially the struggles with museums and maintaining a positive outlook. We bought some of the older portraits that he had done. 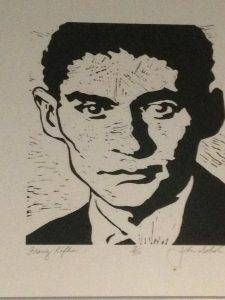 To this day, I eat breakfast under Franz Kafka’s watchful gaze. Importantly, John showed us what he was doing with new media, notably tar. We all know the old trope about “Oh, so-and-so is okay, but I really like the stuff he did when he was younger.” While that is mostly pop music BS, the fact is that watching an artist develop something new is fascinating. Art involves much more sweat and thought than eureka. Every day, I have this powerful motivating image looking back at me. John Sokol is one of the very few people that I am writing about in YGtCTO that I have actually spent any time around (and it has not been much and that time was long ago). Based on that limited interaction, let me wish you artists in your life. You’ve Got to Check This Out is a blog series about music, words, and all sorts of artistic matters. It started with an explanation. 216 more to go.